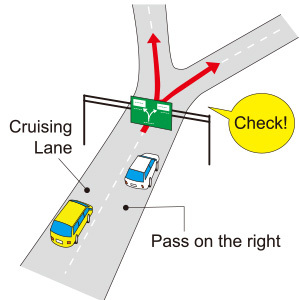 Japan’s Rules of the Road - West Nippon Expressway Company Limited. Drinking and driving is strictly prohibited! Drinking and driving is severely punished. Cars drive on the left. When driving on a two-way road, cars drive on the left. On a one-way road, obey the road signs. Car riders are obligated to wear a seat belt. Children under the age of six are required to use a car seat. It is forbidden to use a mobile phone or stare at a car navigation screen while driving. Always stop at stop signs, and check left and right before progressing. An automobile-only expressway, which has no traffic lights except in special situations. The speed limit is set higher than ordinary roads, and it is necessary to pay a toll (some regions are free of charge). IC (interchange) is where expressways and general roads connect. It is only possible to drive on and off expressways on ICs and ramps. JCT (Junction) is a place where more than one expressway join together. On the expressway, all signs offering information about entrances, exits, and road service facilities are green. Alert signs are yellow, the same as ordinary roads. An arrow shows the direction for the road, and place names and other important information is displayed in Japanese and English (place names are spelled out in alphabet letters). Signs indicating upcoming entrances and exits also indicate distance. Kiloposts are signs that indicate the distance from the starting point of the road (units are km). They are set every kilometer, and are useful for determining location. Use your kilopost number as a reference for your location when calling for help in an emergency. Allow sufficient distance between vehicles, and please drive safely. The distance between cars markers can help confirm the distance between the your own car and the car in front. Check the signs and decide where you want to go before arriving at the JCT/IC (Junction/Interchange). Make sure to accelerate enough before merging. The left lane is for driving, and the right lane is for passing. Be aware of other cars when changing lanes. Keep your money and toll card in an accessible place. Watch for information displays about congested traffic. The last car in a traffic jam should blink the hazards around 10 times. If someone lets you merge, blink the hazards 2 – 3 times to say thank you. Drive in the right direction! Copyrights © West Nippon Expressway Company Limited All rights reserved.